Inbox Inner Circle is an email marketing course that claims to help you set up your own email marketing campaign. However, it comes with mediocre contents and some nasty up-sells. Important question remains – is Inbox Inner Circle a scam? Inbox Inner Circle is one of the newer products of Anthony Morrison, who is now infamous of producing several low-quality products with ridiculous up-sells, including Hidden Millionaires that charged $3995.00 for Google Adwords placement back in 2008. 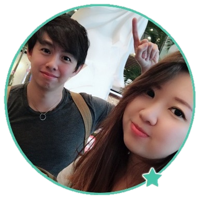 He’s now back with Inbox Inner Circle, which uses a generic sales page with a video that shows you nothing other than hypes and hypothetical income potential with his system. 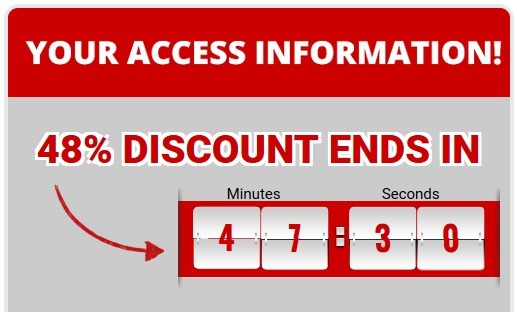 Like many other questionable online opportunities, Inbox Inner Circle includes a fake countdown timer in their sales page to give you a false impression of limited time discount. In fact, the countdown timer is just a computer script. If you refresh your browser, you’ll notice that the timer resets itself, too. There is no limited time discount, and this is the first red flag you should be aware of when it comes to Inbox Inner Circle. Fake countdown timer is one of the overused tactics in online scams to pressure people into making an impulse purchase. This very same tactic was also used in blatant scams such as The A to Z Cash System and Abbey Blog scams. But this is not the only questionable sales tactics used by Inbox Inner Circle. The product is initially offered for $77, but if you click away enough times you’ll be able to slash the price down to just $7. If the product is really as good as Anthony Morrison claimed, why would he subject himself to discount after discount, and eventually selling his product away at more than 90% discount? He just wants you to purchase Inbox Inner Circle very badly, because the real meat grinder begins in the members area. If you pay more than $7, you are getting ripped off, even before he starts ripping you off. Inside the members area, you will have access to around 2 hours worth of video contents, but many of these are funnels to get you purchase other products that he’s affiliated to. If you follow everything Anthony Morrison has to teach you, you are going to shell out hundreds of dollars more, which he conveniently left out in his initial sales pages. Of course, when you sign up for all these additional services, Anthony is earning from you one way or another. Either as an affiliate, or from his own programs such as IncomeEDU. 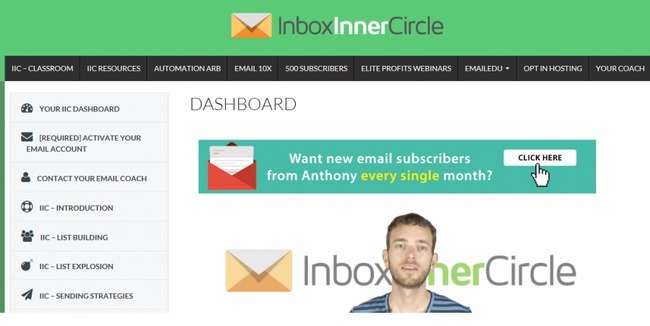 What happened to the 500 subscribers that Anthony promised with Inbox Inner Circle? Turns out you need to sign up with his affiliated email autoresponder, Global Virtual Opportunities (GVO) in order to get them. It costs $10/month for GVO’s services. Of course, Anthony is going to earn a commission when you sign up with GVO. However, I wouldn’t bet my marketing campaigns on these 500 subscribers, though. Imagine what happens when everyone who purchased Inbox Inner Circle gets their 500 subscribers from the same pool. These subscribers are going to get so many spam emails, they will not open your emails at all. Let alone buying things from you. One more thing, did you notice the tab “contact your email coach” at the sidebar? Don’t even try to click on it. If you click on it, you will be required to fill up a questionnaire to “check how serious you are” about email marketing. You will be required to put down a budget and leave your telephone number at the end of the questionnaire. If you did submit your number, you will receive high pressured sales calls to talk you into buying their expensive 1-on-1 coaching services. And the price fits the upper limit of your budget just nice. Talk about coincidence! It’s an ingenious way to know how much one is willing to pay, and propose a service that costs exactly just that. Should I Buy Inbox Inner Circle? Hey Karla, glad that it helped. Stay safe! By Emails For A Refund, But No One Has Responded! Why Should They? They Have My Money!! I wish I read your review earlier. I paid $77 and ever since then I have been receiving emails to pay for additional services to set my email business up. I seem to be forking money out all the time . Also to other of his contacts. I got conned by the fake timer as well. 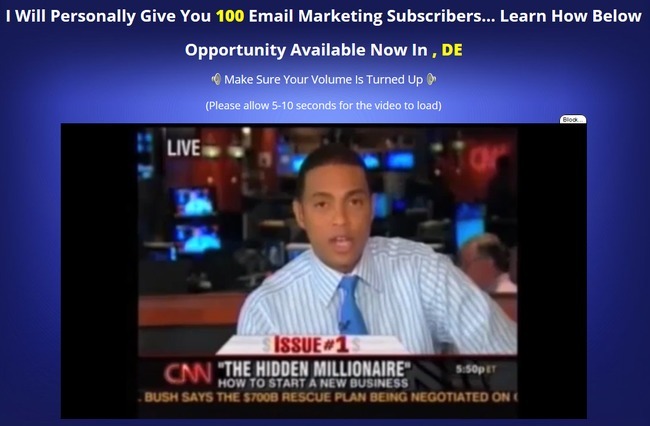 I was going to sit up tonight to watch one of his webinars so I can qualify for 10 free email funnels . Have to be watching or I will not get them for free. I have to start work at 6 am tomorrow in a local underground coal mine, so thanks for your review I will get a early nights sleep. I will cut my losses and try not to be too trusting. Seems like most people get conned by online scams before learning their lessons. You can be trusting, but you need to trust the right methods and programs. Some tips to avoid future scams – make sure the program provides you some value before paying them. If it sounds too good to be true or if the seller hides information about how it really works and demands that you pay to find out more, better stay away from it. The Inbox Inner Circle business system is very tempting, but I’m glad I delayed my actions. You’re right, a business opportunity should be offered on a free trial basis at first. If it works, the clients will definitely pay the premium price to continue their membership. I will now look into the Wealthy Affiliate’s program. Thank you! Thank s Edward… I was on the verge of dong this. Glad I pulled back to research. Do you know of MOBE or SFM ??? Never heard of SFM before, what’s the full name? Thank you for your advise. Is there a REAL prosram that doesn’t break the bank to get started and absolutely works? I’very recently been laid off and because of my age it’s very difficult finding work. I need a program that will help generate a source of income and quickly become I lose everything. Please , please let me know if there is anything that actually generates real money to pay these bills. Hi Jeana, you can get started with Wealthy Affiliate, which is completely free to get started. From there you learn to build a website, and only subscribe to learn more when you have started getting results. Thank you. You just saved me $77. I just lost $77 , the coach was very nasty, asking me how much I have in the bank , how much my home is worth , my vehicle etc. I sign with them four days ago and I can’t find anyone to refund my money back to my acct. does anyone ? Please let me know. Thank you! you just save me $77. Hey Said, no problem, stay safe!